Here is the SPECIAL REPORT that you requested! There are 7 simple words that threaten to drastically affect the rest of your life. Those words are, “It will go away all by itself "
It is a non-surgical, decompressive therapy for the relief of back and leg pain or neck and arm pain. After a significant amount of research, Dr. Williams chose what we believe to be the most sophisticated, technologically advanced, state-of-the-art decompression in the world. • arm or leg pain/numbness. Most certainly! One study 13 documented by MRI up to 90% reduction of disc herniations in 10 of 14 cases! Other studies 14 have reported that the majority of ruptured disc patients achieved "good" (50-89% improvement) to "excellent (90-100% improvement) results after spinal decompression therapy! The specific treatment plan will be determined by the doctor after your examination. Our fee is up to 20% off of treatment packages if paid in advance. We want make it easy for you to learn if you are a candidate for Spinal Decompression Therapy. 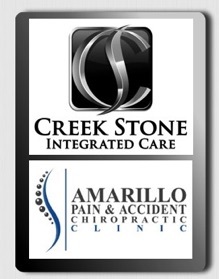 Call us here at the office at (806) 355-3000 for your FREE consultation! 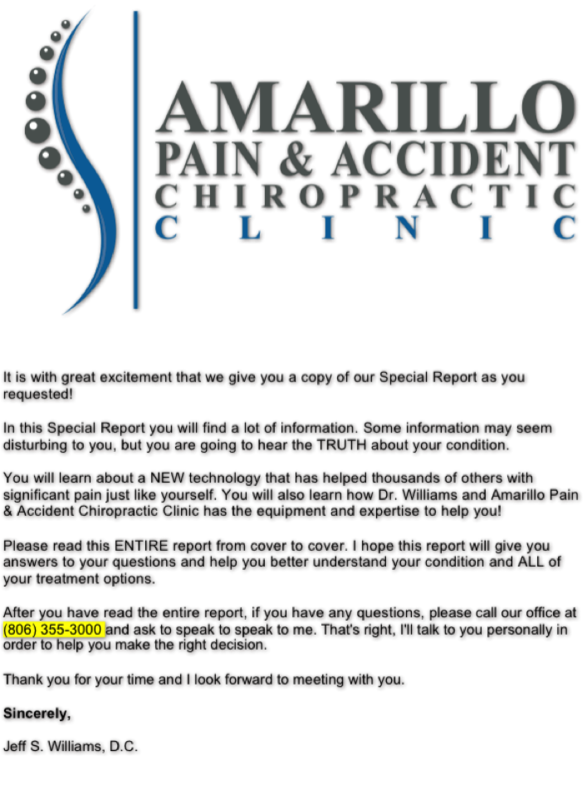 If you need any additional information, please call our office at (806) 355-3000 and ask to speak to me. That's right, I'll talk to you personally in order to help you make the right decision. I look forward to having the opportunity to help you. So please…call today! PS: Remember, if you call us with questions concerning spinal decompression, as a gift to you, we will set you up a FREE consultation so that you can learn if you are candidate for Spinal Decompression Therapy! Why continue to suffer when the solution might be only a phone call away? PPS: One last thing. If I determine that you are not a candidate for Spinal Decompression Therapy, I will tell you that and work to refer you to a doctor who can hopefully help you. 1. Gionis. Thomas. MD, JD, MBA, FICA, FRCS et al. The outcome of a clinical study evaluating the effect of nonsurgical intervention on symptoms of spine patients with herniaated and degenerative disc disease is presented. Spinal Decompression, Orthopedic Technological Review. November/December 200: Volume 5. Number 6: Pages cover. 36-39. 5. Bigos S. et al. Acute Low Back Problems in Adults, Clinical Practice Guideline No. 14. Rockville, MD: U.S. Public Health Service, Dept. of Health and Human Services. AHCPR pub. No 95-0642, Dec. 1994. 10. Mushinski M. Average hospital charges for medical and surgical treatment of back problems: United States. 1993. Statistical Bulletin. Metropolitan Life Insurance Co., Health and Safety Division. Medical Dept., April-June 1995. 11. Bigos S. et al. Acute Low Back Problems in Adults, Clinical Practice Guideline No. 14. Rockville, MD: U.S. Public Health Service, Dept. of Health and Human Services. AHCPR pub. No 95-0642, Dec. 1994. 12. Croft, Peter, et al,. Outcome of Low Back Pain in General Practice: A Prospective Study. British Medical Journal 1998: 316 : 1356-1359 (2 May). 13. Eyerman, Edward. Simple Pelvic Traction Gives Inconsistent Rellief to Herniated Disc Sufferers. Journal of Neuroimaging, June 1998. 14. Shealy, C. Norman, Borgmeyer, Vera. Decompression, Reduction, and Stabilization of the Lumbar Spine: A Cost-Effective Treatment for Lumbosacral Pain. American Journal of Pain Management Vol. 7 No. 2 April 1997. Welcome to our free decompression report. see why we think we can change your life!